Previous articles had been on discontinued or hard to get construction toys, but now I present you with a toy still on the market, and quite affordable comparatively. 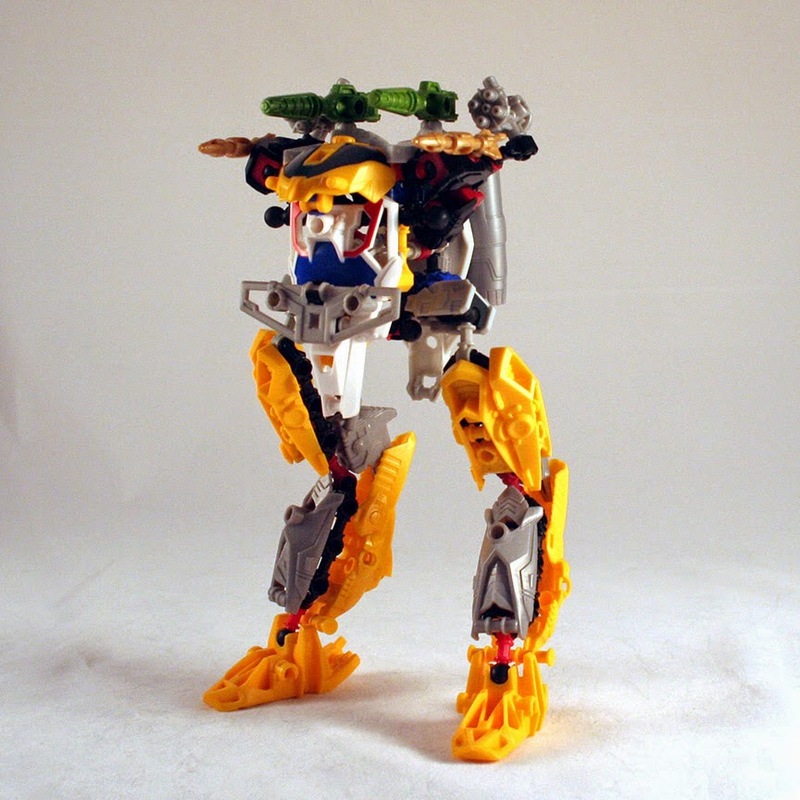 To further compete with the Lego toy lines Hasbro made a counterpart to Bionicle. 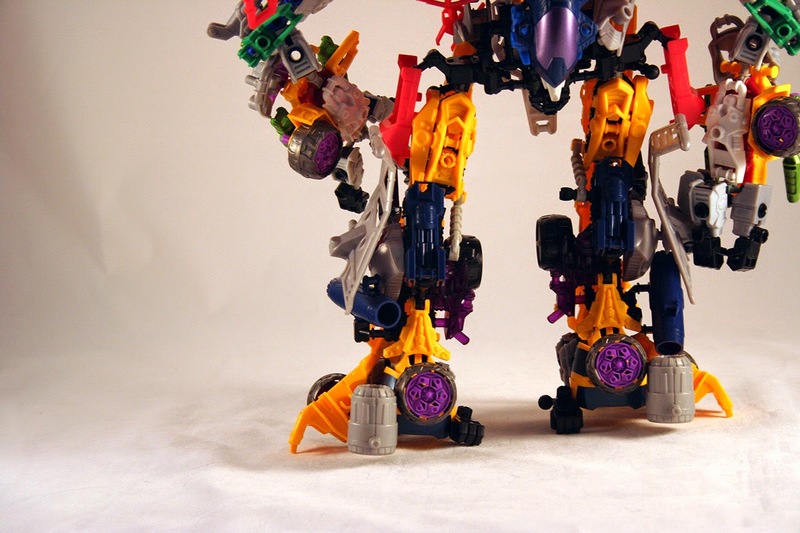 This also does something the Kreo line could not do—transform. At least without having to disassemble the whole thing then rebuild it into its alternate mode. 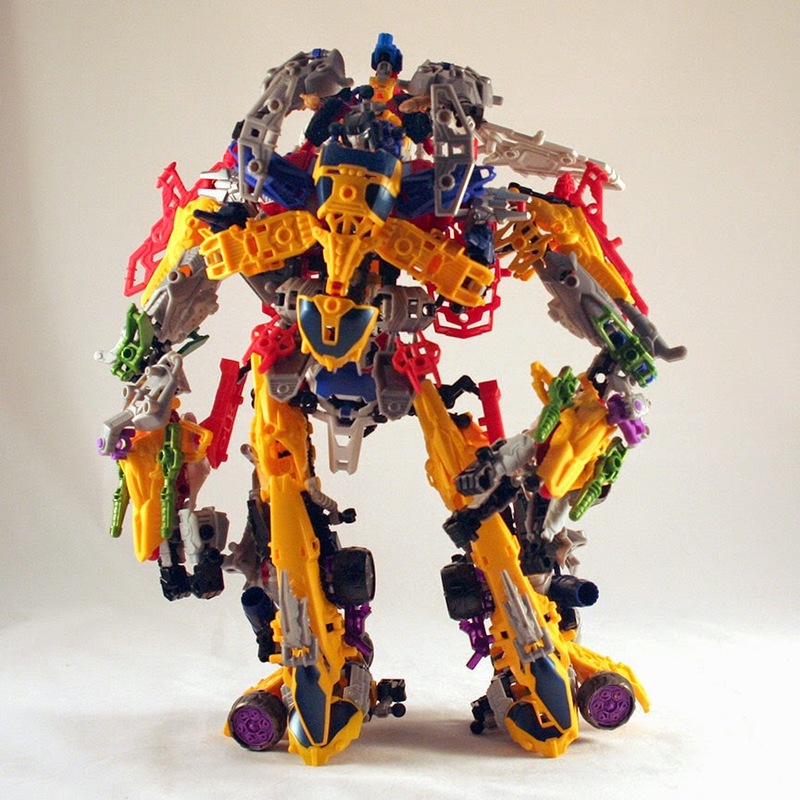 When these first came out, had no interest in them, for similar reasons I never got into bionicle. The bots were too skeletal and seemed unfinished. Well since they had been out a while, and they had to make room for new figures in this line, stores started clearing them out. Stack that with printable manufacture coupons and you can get these for quite the deal. I got a couple sets at first just because its wasn't an expensive gamble. Once I got my hands on them and got to fiddle around some I saw more potential in them. Of course to get them most out of them you need at least a few to build them up. They are one line of toy I feel having doubles makes them more worth while. I messed with them the first day I got them, but then realized I had to do a part count of everything I bought after that. An Ironhide set was missing a single part, and my starscream head was not painted right. After calling hasbro, they sent me those parts out after a few weeks. It would had been sooner, but they claim they were all on back order. In total I had bought eleven sets of these figures. All on sale of course, and luckily none of the others were missing anything. Many parts are shared among the different kits, just in different colors. It seems the heads, and chest pieces are the most unique pieces among the kits besides their hue. 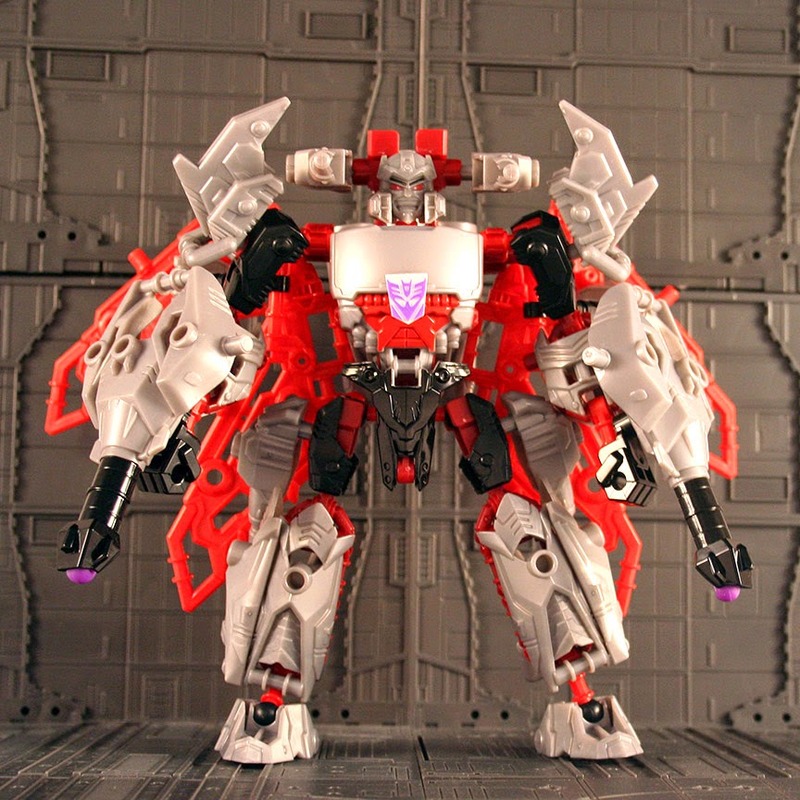 I have a feeling due to hasbro liking repaints we will see many more colors of the same parts that already exist to make new bots they can sell. Out of the sets I got, I picked up; 2x Optimus prime vs Megatron sets, 3x Bumblebee, 1x Ironhide, Starscream, Soundwave, and Wheeljack. 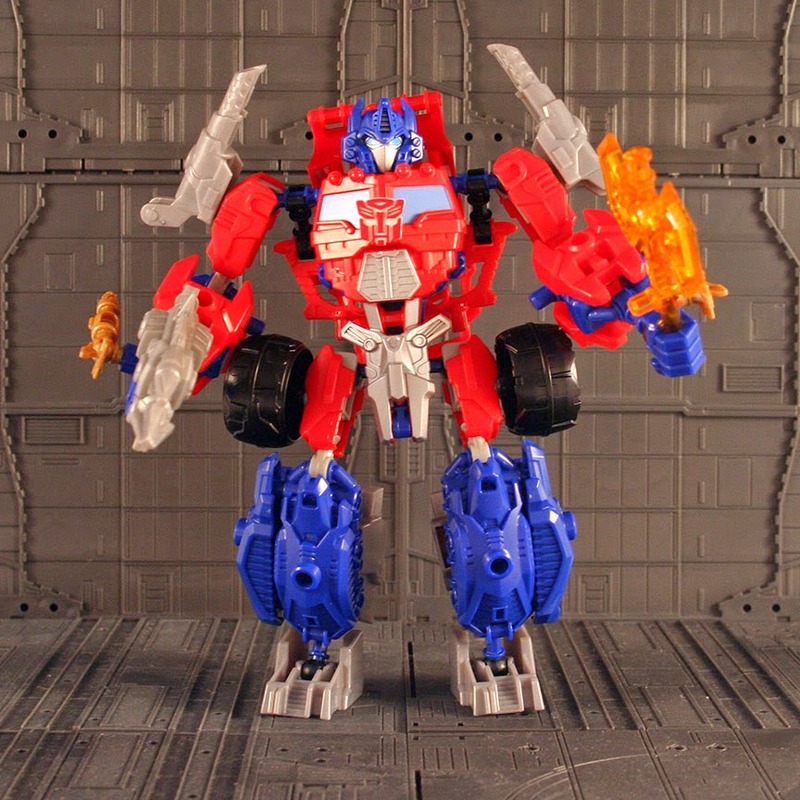 Multiple of an set allows for a much more bulked up bot. 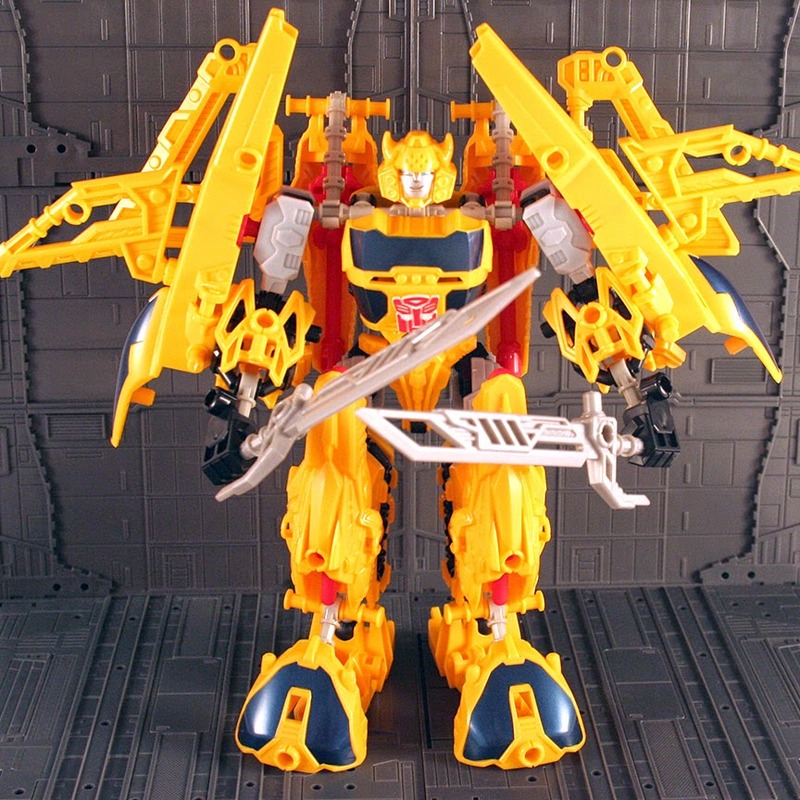 Besides the head design, and most of the parts being yellow, the bumblebee kit has some of the best parts. Another neat aspect of these is that they fit the pegs of transformer figures. This means you can make all sorts of weapons, and armor, etc... for your robots. They also serve as a base for making customs. You can use these as the frame to build more finished looking bits over to create nice upgrades for your bots as well as long as your willing to sacrifice some parts. 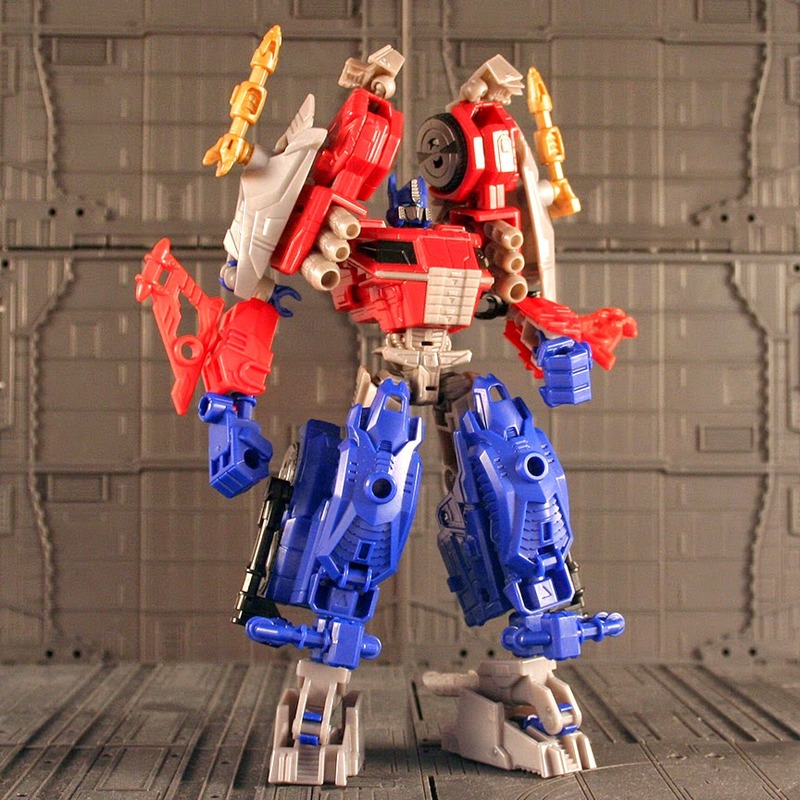 By using this mock up, on FOC Optimus I see an idea I may try and tackle later with a 3d printer. 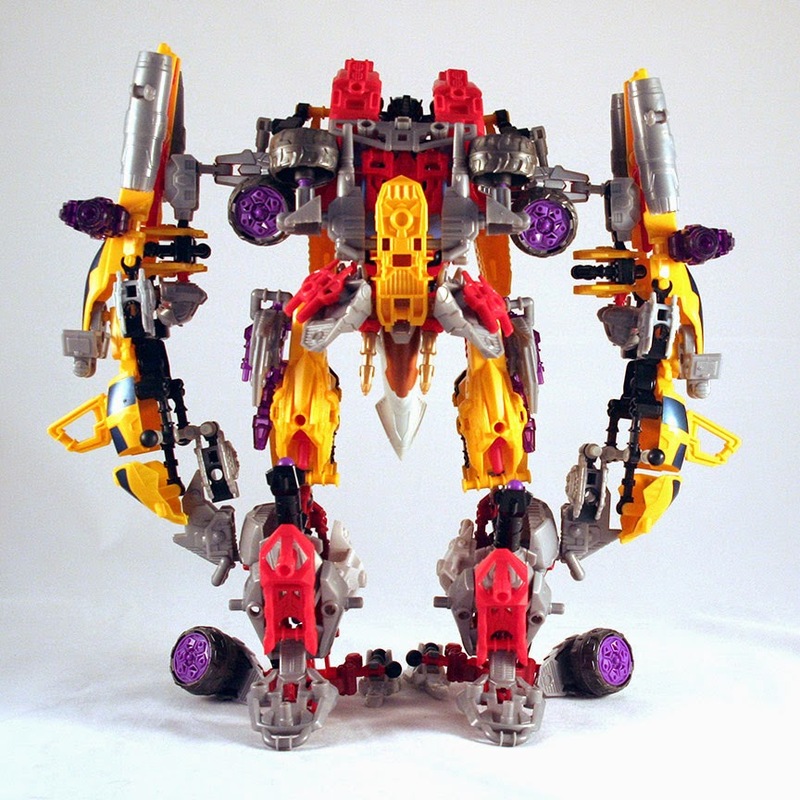 creation I saw on the TFW2005 boards. On a note of how easy they are to build with, I would put them right between Assemble Borg, and Mugenbine. They would be a lot more versital if they designed some better connecting parts. Sadly, I think the engineers never intended on these going beyond the scope of a single action figure with swapped accessories. That is where having many sets comes into play. Like the Mugenbine, the more you have, the more parts you can use to get other things connected and expand the figure into something bigger and far different from what the basic form presented. The bigger you go, the more you can deviate from the silhouette of the intended bot and come up with something more original for the sake of concept design. 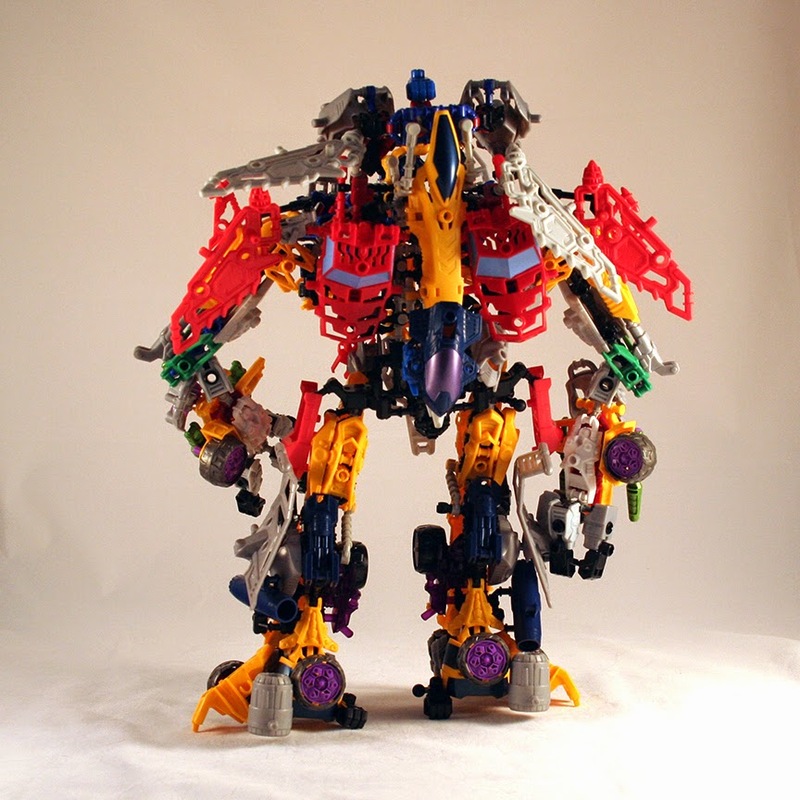 Below are some samples of my own creations with these construct bots. I found some interesting ways to combine the torso skeletons so that they served as a platform to build on for larger scale. I also tried to keep articulation in all the limbs. This sometimes made for some unstable bots. Especially in the hip area. These coated ball joints are quite strong, but can only take so much. Joints have to be created with supports from other parts that still allow movement. At this scale, playability is gone, but as a display piece or model, they work quite well. 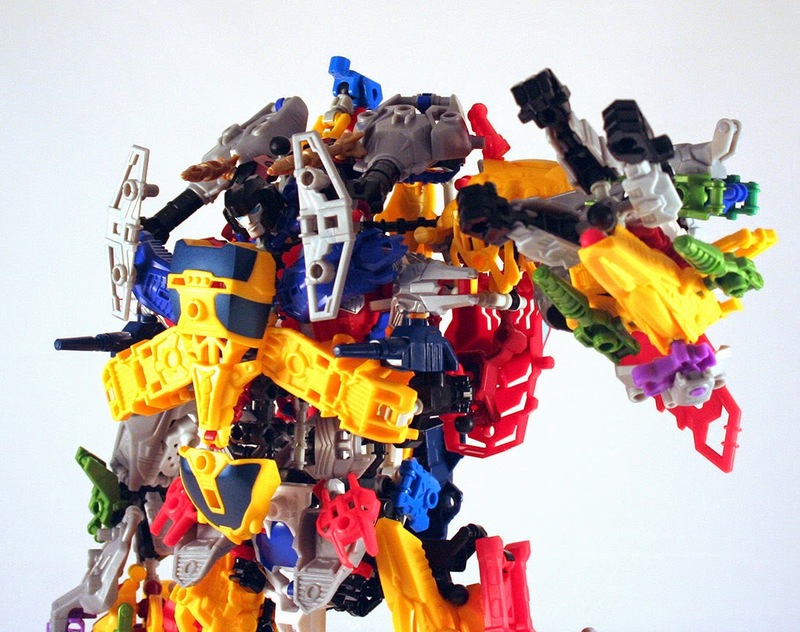 You can stray away from autonomous robots and get into making military hardware. 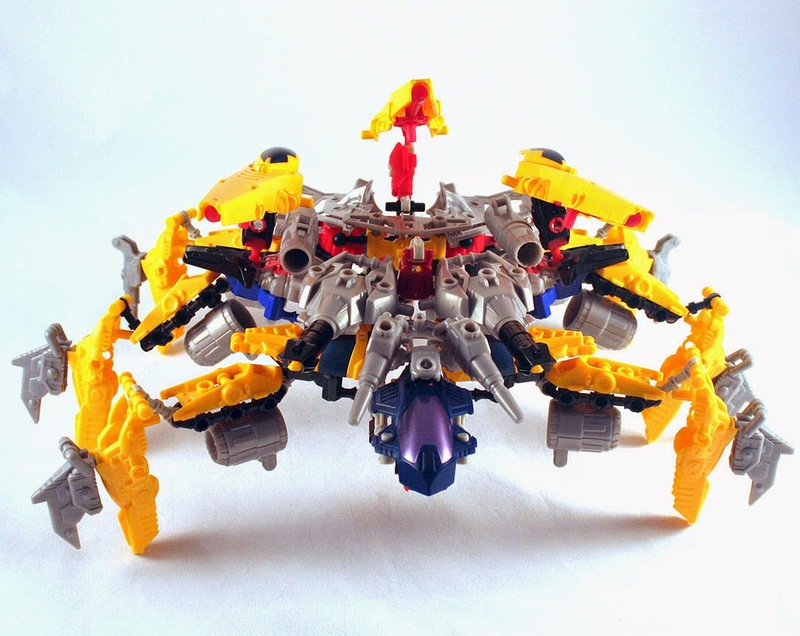 This spider tank is heavily armed and ready to fight. and these parts allow you to pull it off. but it took a bit of adjusting to get him to stand right. Still articulated. Clamping hands and shoulders with a whole range of movement. Next I went with a design that had less bulk and could support all its parts better. I have always been a fan of multiple arms for robots, so I went with a Kali inspired robot. If only it was all blue and had a more feminine head. My largest creation. It took more time trying to figure out additions for the joints to support it than actually building it. 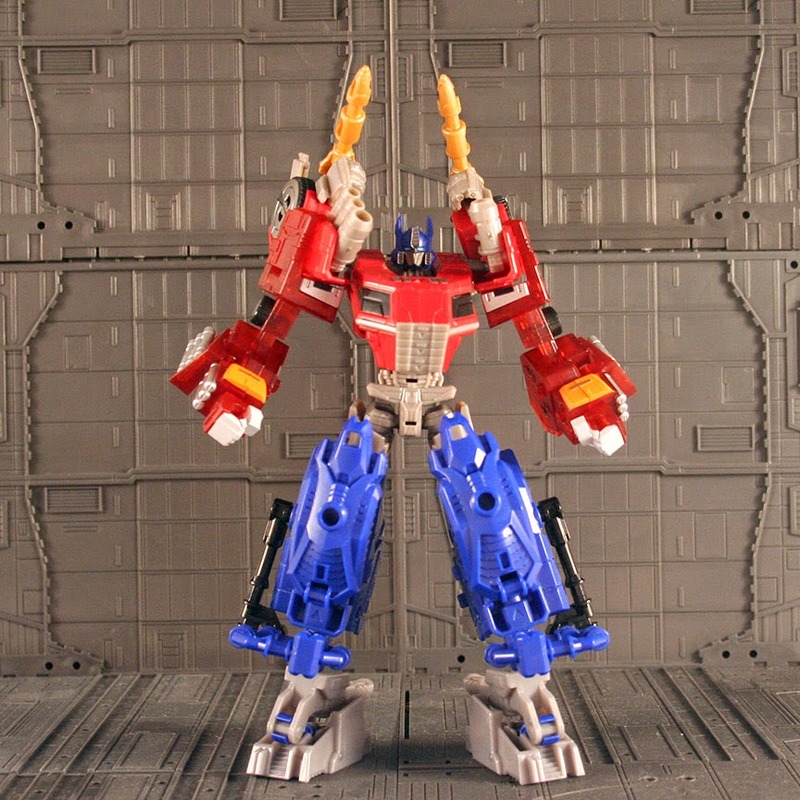 To give you a scale reference, he is bigger than Energon Omega. Or for you Gokin collectors, bigger than SOC Dancouga. 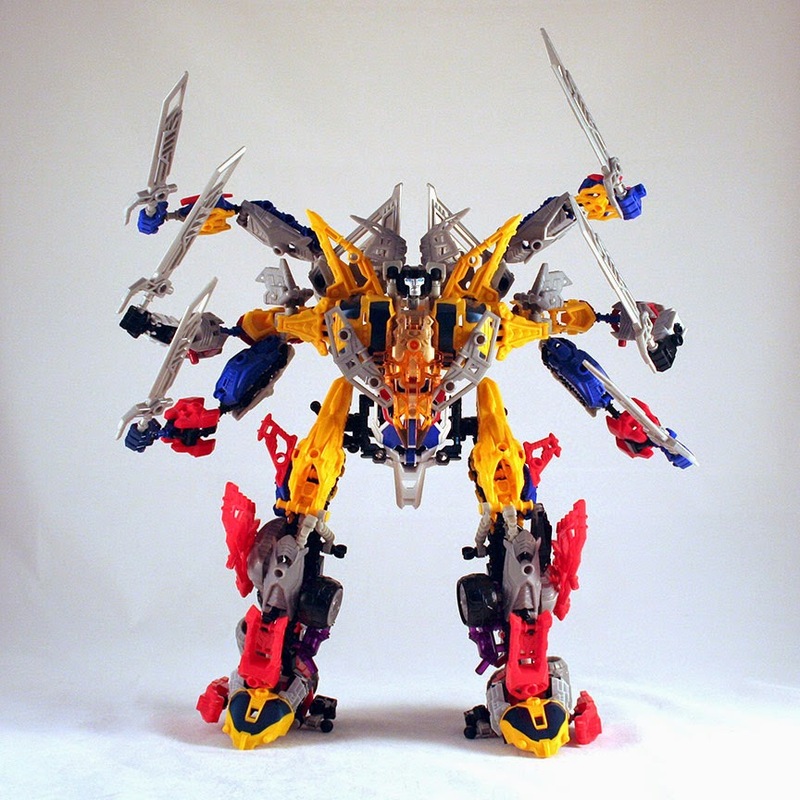 The shoulders are poseable using two joints, but require a latch system to hold the arm up once it is raised. It uses a double jointed elbow, though its limited in range. The three fingered claw is also articulated. A view from the back. Most parts from all my kits were used to cover any gaps. Multiple parts used to add stability to the feet. Also notice the parts to reenforce the knees. 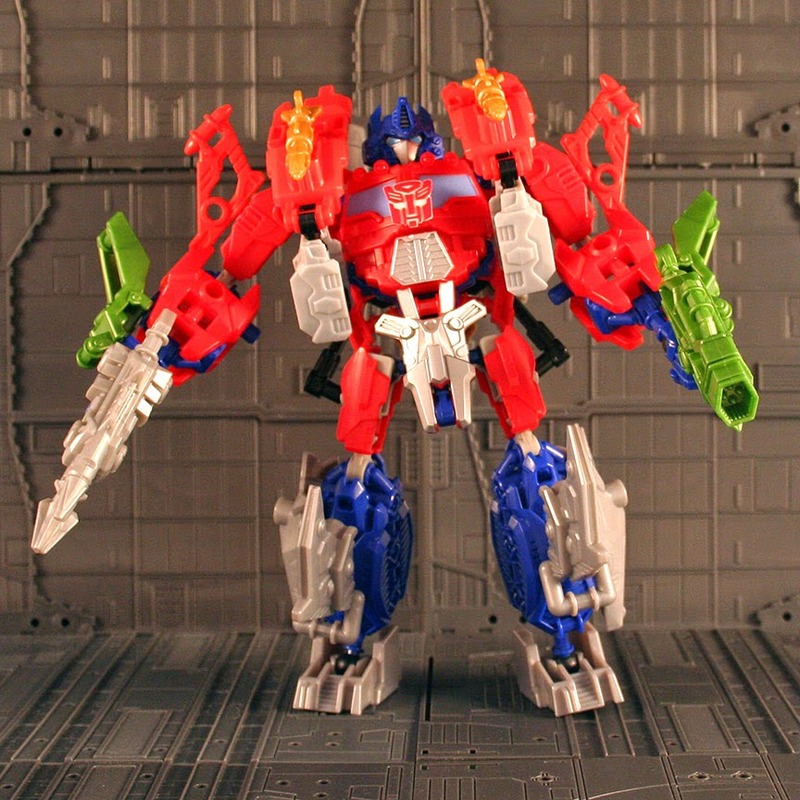 You can also see the parts I added to the hips that can be adjusted to keep his torso from toppling over. I think a few things could really improve on the line. A short peg that allows you to connect parts, and a long peg that could go through a few parts to connect them. Also the clips they currently use could use a version that had the opposing end turned 90 degrees. You would be able to build up the frame much easier to bulk up the design. I would had liked to seen better heads as well. 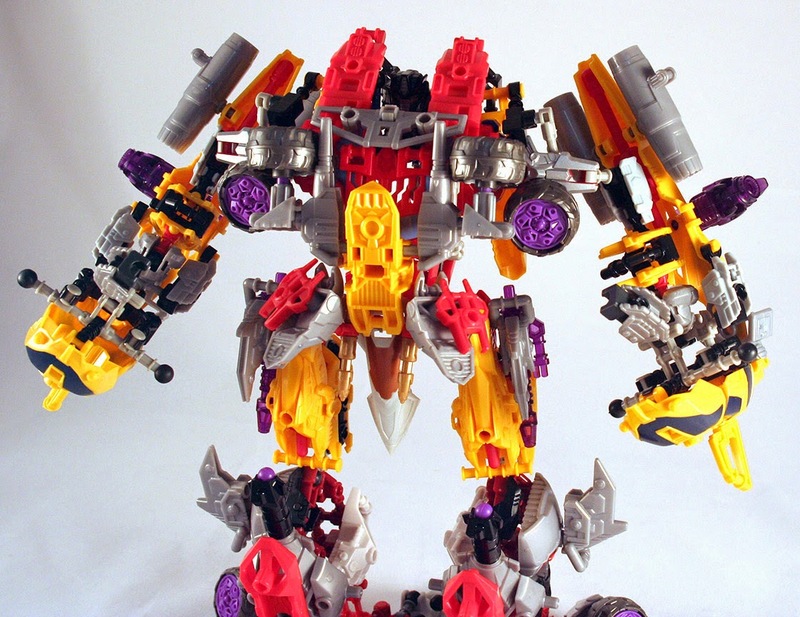 I think you might find parts from other building toys like lego technic that might be used to make these even more versatile. Even though there are some small issues with these, this is another good collection for the concept designers tool box that is affordable and expandable enough to come up with robots, vehicles and whatever else you can imagine. I think this is one worth hunting down while they are still around for fueling your imagination. 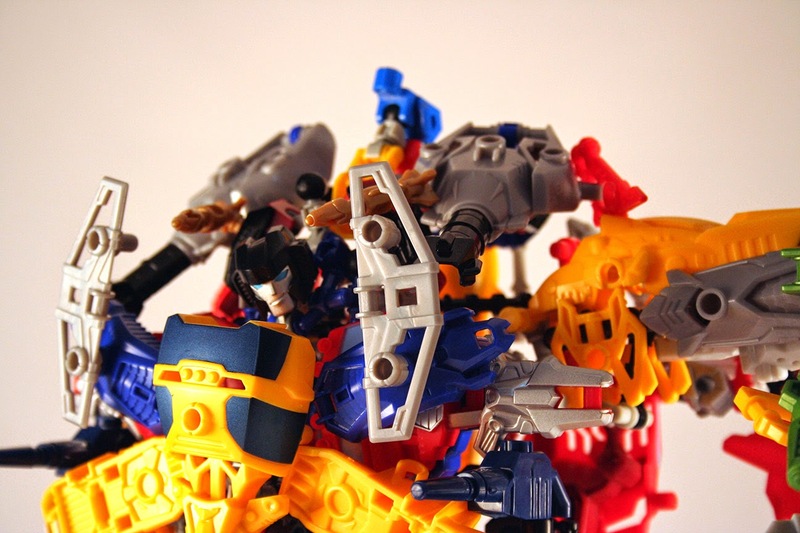 You can check out other creations over on tfw2005 where others are showing off their creations.